FROM TINY 0-8-0s PULLING AND PUSHING COAL TRAINS ON A MOUNTAIN NARROW GAUGE TO THE 262 MPH SHANGHAI MAGLEV TO THE WORLD'S HIGHEST RAILWAY IN TIBET, THESE TWO HOURS SHOW AN INCREDIBLE MIX OF TECHNOLOGY. REVELATION JOURNEY'S OCTOBER TREK COVERED 7,000 MILES BY TRAIN AND INCLUDED SIX RAILWAYS WITH STEAM OPERATION. SURREAL TIBETAN LANDSCAPES CONTRAST WITH COASTAL REGIONS AS WE GO FROM SHANGHAI TO SHANGRI-LA, THEN TO ALMOST THE RUSSIAN BORDER. 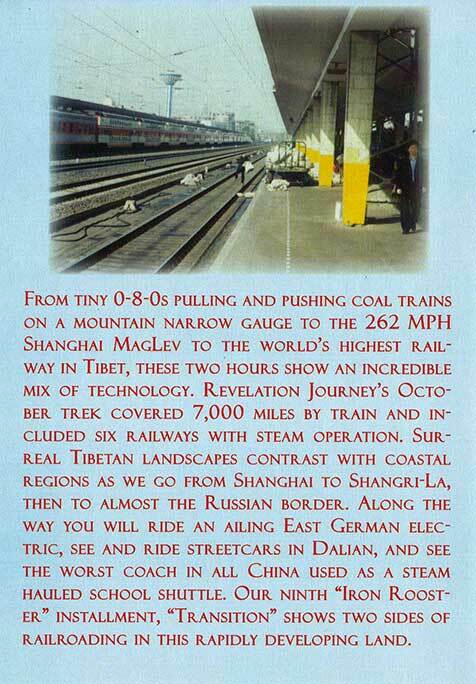 ALONG THE WAY YOU WILL RIDE AN AILING EAST GERMAN ELECTRIC, SEE AND RIDE STREETCARS IN DALIAN, AND SEE THE WORST COACH IN ALL CHINA USED AS A STEAM HAULED SCHOOL SHUTTLE. 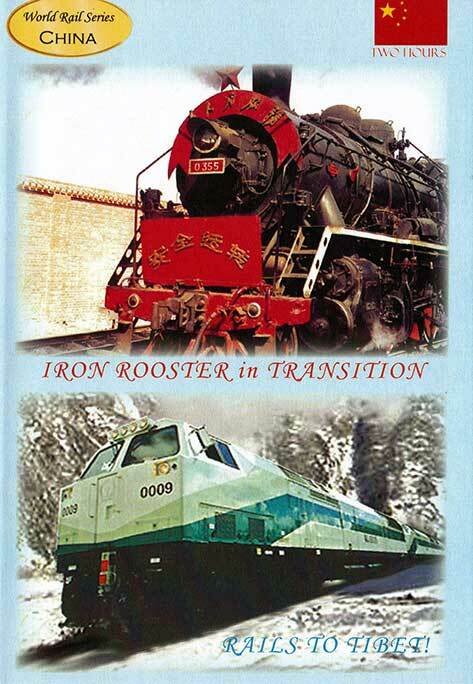 OUR NINTH "IRON ROOSTER" INSTALLMENT, "TRANSITION" SHOWS TWO SIDES OF RAILROADING IN THIS RAPIDLY DEVELOPING LAND.